The clouded salamander is a medium size salamander that reach around 8 to 10 cm and have slim elongated legs and are very agile which make them one of the rare amphibians of Canada that likes to climb. 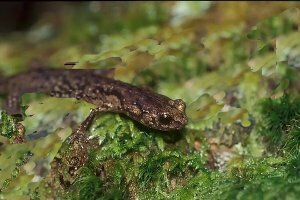 Clouded salamander are member of the Plethodontidae family : the lungless salamanders. Clouded salamanders have usually a brown and grey speckles on it’s back and a grey and yellow spots on their belly. These salamander also have 2 other characteristic that make them easier to identify then most of other amphibians : they have really huge big eyes and they appear to smile due to the curve of their mouth. Clouded salamander goes true 2 colour phase during the course of it’s life and primarily shows a browner dorsal colour scheme which evolve to a paler grey scheme. salamanders have nocturnal habits and very active in wet weather. Due to the lack of distribution and lost of it’s natural habitat which mainly consist of forests where they nest in trees. It is threatened by habitat loss due to urbanisation and the wood exploitation industry..